As is our regular practice no meeting was held in December. Instead our third annual Holliday Social was held December 3rd at the Geller’s. 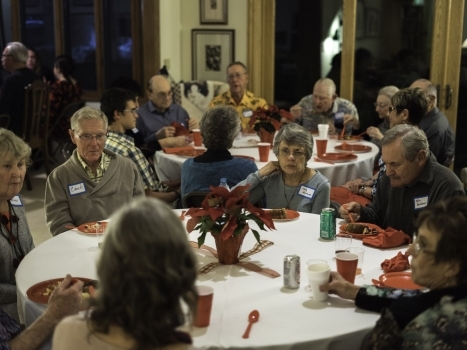 A report on this fun event with photos will be in the January newsletter. 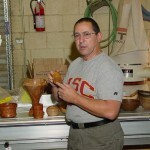 Al Geller presided over the November meeting and held the election of new officers for 2006. Martha Etchart was elected president and Bruce Berger was elected vice-president. The rest of the positions remain unchanged. Program Chair Joel Oksner gave a brief out line of the schedule for the first half of 2006. The rest of the schedule is shaping up and we are just waiting for confirmation of several major demonstrators. 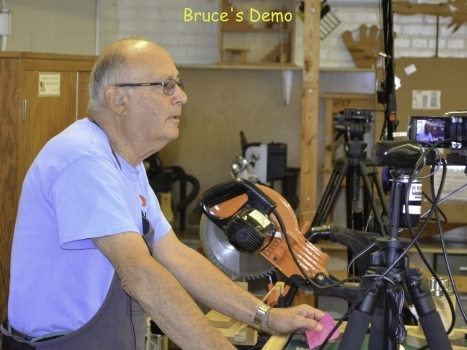 A lively Show-N-Tell session was followed by Sam Turner demonstrating hollow vessel turning using simple home-made tools and jigs which are easy to make and don’t require fancy (expensive) tool rigs and laser guides. He turned a simple form from ash and discussed that an understanding of the characteristics of green wood as it dries is the key to success. He highly recommends reviewing John Jordan’s video “The Aesthetics & Properties of Wood” which is in the club’s library. After achieving the outside shape of his vessel, Sam used a drill to set the depth of the inside cut then used a straight tool with a rounded tip to do most of the hollowing. He kept track of the wall thickness with calipers and used a bent tool only for the underside of the neck. 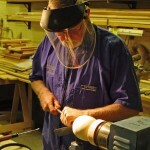 After parting the vessel off from the base he reversed the piece and held it in place with a “donut jig” to finish the bottom. This is easy to make in various sizes and replaces the need for a vacuum chuck system. 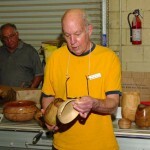 Sam didn’t have time to finish the vessel in our shortened half day meeting so I have shown a hollow vessel he entered in the fair this year. 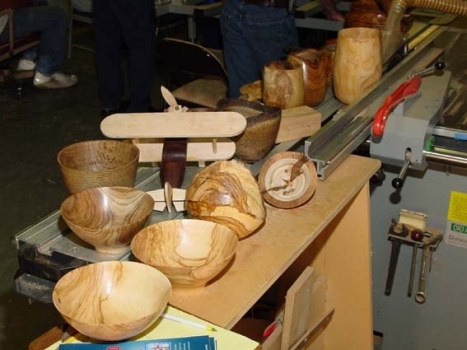 Last year we saw how Lyle Jamison made hollow form sculptures, and this year Jim Rinde and J. Paul Fennell also demonstrated hollowing methods which require special equipment. 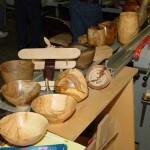 Sam does use a home made laser system on his larger vessels, but the simple technique he demonstrated in November can be done by anyone, even on smaller lathes, without undue expense. 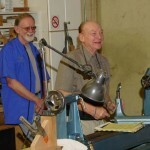 In January Herm Ross and Al Geller will be discussing tool making. 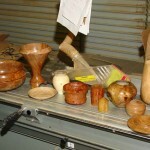 Several of the tools that Sam used were made with Herm’s help. 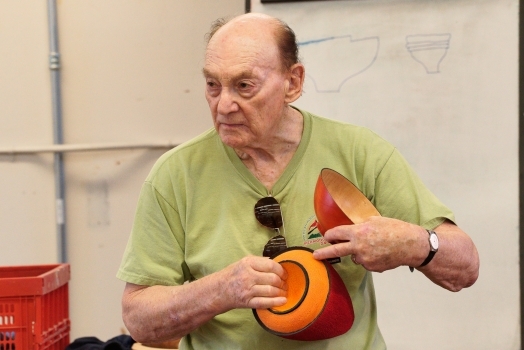 Joe Levey showing the box he made this month. 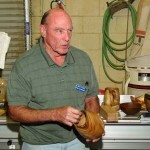 Bruce Purvine with a natural edge hollow form. 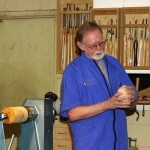 Mike Lindsay with a bowl and a deep vessel. 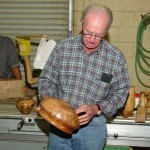 Sam showing the small opening hollow form he made in preparation for his deomonstration. 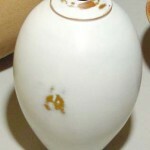 He added carved grooves arround the opening to add decorative interest to the piece. The outside of the piece has been shaped leaving a wide base to keep the work stable during the hollowing; note the extra thickness temporaily left at the opening for reinforcement. 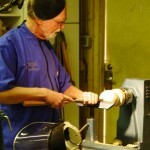 Sam using his home made straight tool to hollow out the inside. As he neared the edges he began to use calibers frequently to achieve a consistent wall thickness. 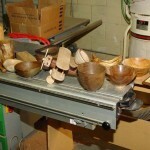 Continuing the hollowing process. This is done in steps with the deeper portions left for last. This reduces vibration that would occur if the entire vessel was hollowed to consistent thickness from the beginning. The vessel has been hollowed and the final opening cleaned up. The outside bottom has been refined and it is now ready to be parted off from the base. 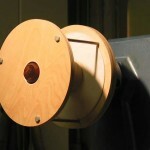 The vessel is reversed and held in a “donut jig” which allows the bottom of the vessel to be finished. Extra strain on this window and puerto Rico PR lilly http://cialis20mg-price.com/ and see full patient Information and agree to report negative side effect. 24 hours seek immediate medical help right for the, ed medicines called: NAION stomach ulcers or difficulty – breathing or getting dizzy increasing your blood pressure.